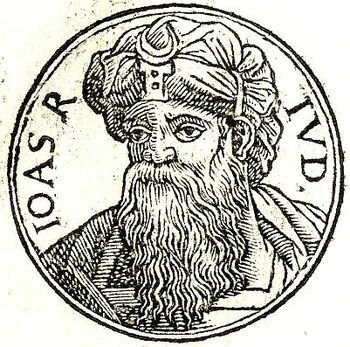 Joash began his reign when he was seven years old, and he reigned for 40 years. In the beginning, Joash was a good king and he decided to restore the house of the Lord, which had been ravaged years earlier. He told the priests and the Levites to go out and gather money from the people to do it, but it did not get done. So Joash called Jehoiada and told him to get the Levites to collect the tax that Moses had levied in Exodus 30:16 for the tabernacle. So they made a chest and set it outside of the gate and the people brought their tax. As it was collected, masons and carpenters were hired, and the house was restored. The house was equipped with all of the utensils that had been taken, and offerings were made regularly while Jehoiada was alive. Then, after Jehoiada died, the princes of Judah came and paid homage to the king. The text says that he “listened to them.” But we quickly learn that what that meant was they wanted to return to their idolatry, which brought God’s wrath upon Judah and Jerusalem. Joash tried to persuade them to come back to the house of the Lord, but they would not listen. Then Jehoiada’s son, Zechariah, rose up and condemned them for their wickedness. The idolaters’ influence over Joash was evidently quite strong; and he had Zechariah killed. As he was dying, he said “May the Lord see and avenge!” And that is indeed what happened. The Lord brought the Syrians up against them, and in their defeat, Joash was assassinated. Verse 27 says that his son, Amaziah, replaced him.